The Teraflops Research Chip (also called Polaris) is the first processor prototype developed by Intel’s Tera-scale Computing Research Program in multi-core and energy efficient computing. The processor was briefly presented at the IDF on September 26, 2006 and officially announced on February 11, 2007 and shown working at the 2007 ISSCC. 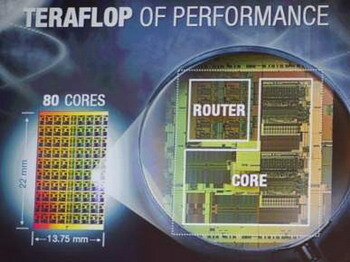 The chip contains 80 cores, each containing two programmable floating point engines and one 5-port messaging passing router. Constructed using a 65 nm CMOS process, the die is 12.64 mm by 21.72 mm (274.5 mm²) and contains 100 million transistors. The package is connected through a 1248 pin LGA with 343 signal pins. Running at 3.16 GHz the chip achieved 1.01 TFLOPS with a total power consumption of 62 W and an on-chip temperature of 110 °C (383 K). Increasing frequency to 5.7 GHz and power to 265 W increased performance to 1.81 TFLOPS and later 2 TFLOPS. i know its late but the facts are really amazing… !!! I simply want to say I am just beginner to blogging and site-building and actually enjoyed this web site. Almost certainly I’m going to bookmark your blog post . You definitely come with amazing articles. Thanks for revealing your web-site.